Like mad scientists, we donned our lab coats and mussed our hair, looking for just the right formula to give our workforce the boost they needed. It wasn’t easy. We wanted to try radioactive insect bites, but HR told us that was a violation of our safe workplace policies. Then, we thought about toxic waste spills, and our Sustainability team politely but firmly shot us down again. Finally, a brainstorm hit. Every person already has access to superpowers – we just had to help them unlock those hidden strengths. We could show them how to amplify their voices, how to communicate instantly with millions of customers, and how to build relationships faster than a speeding broadband connection. We could teach them to use social media. So, the Social Media and Community University (SMaC U) program was born. Now, our business is filled with superheroes. Their powers are strong. Our sales superheroes have buffed up with a 69 percent year-over-year increase via social media. Our customer service heroes are battling the forces of customer dissatisfaction with a 98 percent first-time resolution rate on over 4,000 cases a week in social media. Our talent acquisition heroes are shining the Dell-signal into the sky, with 36 percent (up from 19 percent) of all external hires coming from employee referrals since adopting social media best practices. SMaC U, like all the social behemoths today, launched with humble beginnings. We began with an official certification program in 2010. In the last 5 years, Twitter grew from 26 to over 300 million users, LinkedIn went from 60 to over 380 million, and the true juggernaut Facebook blotted out the sun by jumping from 400 million to over 1 billion users. During that same time, we’ve grown the ranks of our social media do-gooders to over 15,000 SMaC certified team members. We’ve delivered over 1,300 instructor-led sessions, and scaled to meet the needs of our global business by developing on-demand certification options. Think of a never-ending 80s action film training montage, where everyone moves in slow motion and inspirational power chords ring out. 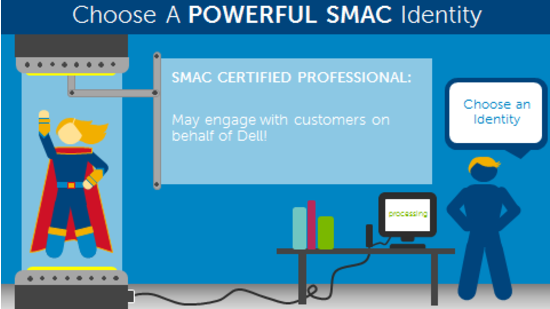 That’s SMaC U certification. 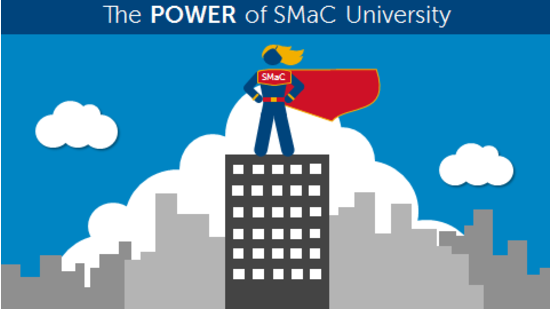 “SMaC U is my ultimate secret weapon. When our training program launched and I was able to incorporate legal lessons into this emerging field we were able to train thousands of employees on legal issues before they ever arose. As a result we’ve had very few risky incidents compared to companies our size. Now, we can’t let our superheroes get rusty, so we’re always looking for ways to keep their skills sharp. We’ve built over 40 unique classes since our program began. Our SMaC U Power Hour sessions, lead by Sean Carey, cover in-depth topics such as the newest social media platforms like Periscope and Meerkat, or soft skills like dealing with trolls and the psychology of social media. We also energize the certified base with upleveled events like our SMaC U UnConference and build a fun internal social culture by organizing movie outings with a social media theme and lesson. Jill Bell, a SMaC U operations manager, sends holiday poems and Valentines love notes. Together, these actions keep our heroes networking, learning and growing together as a global team. 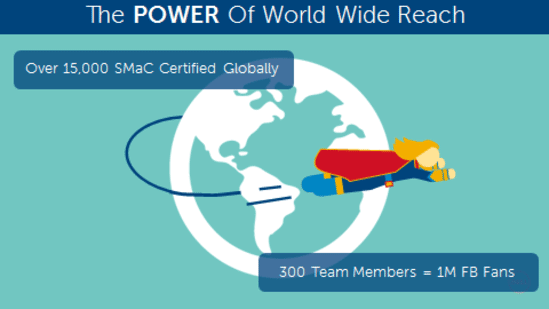 “SMaC U has been the catalyst needed to quickly grow our social media customer support team. They have helped us to build a solid foundation and guided us to be one of the most successful social media customer service programs in the industry. But they don’t stop there. 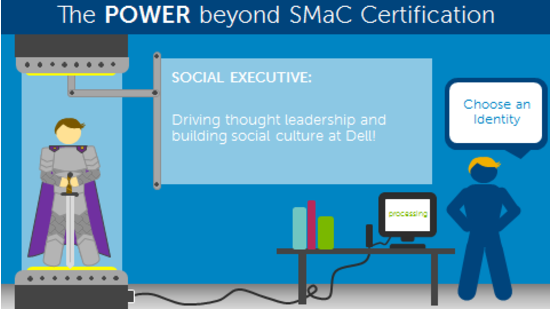 Dell’s subject matter experts are a special breed of superhero. They’re always out there in the city, shining a light on lack of knowledge and helping citizens to live more successfully. Whether they’re talking about the cloud, the Internet of Things, software, security, or beyond, their expertise deserves to make it to the masses. SMaC U’s SocialSME program, managed by Gretchen Garretsen, gives our experts next-level training, support, and analytics to keep them focused on the needs of our customers and sharing their technical and industry know-how. We’ve turbocharged 253 Social SMEs since the offering was launched, and these elite heroes have been growing their social footprint, reach and influence by leaps and bounds. “Since graduating from SMaC U some 3 years ago, I’ve more than doubled my following on social media. Finally, there are our executives. Always battling to help our customers build future ready enterprises, we stand at the ready with training and consulting to help them and their organizations to fight the good fight. On the individual level, we launched a white-glove 1×1 learning program called #SocialExec to help them establish their personal brands and thought leadership through social channels. We now have 63 socially savvy executives, connecting with customers and leading both internally and externally. We’ve worked tirelessly in the SMaC U labs to find new ways to embed social media into the DNA of Dell. We’re proud of what our superheroes have accomplished over the last 5 years, and we’re looking forward to enabling even more in the future. We may not be the support team that our heroes deserve, but we’re honored and humbled to be the support team that they need.